First appearance "The Provolone Ranger"
Sudden Death Valley is an area located within the Wild Western frontier of the Mushroom Kingdom. The valley is essentially a large desert, notable for its very high temperatures and large rock formations. The Double Cross Ranch is located here, and possibly the town of Mushridge as well. 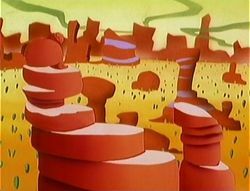 Sudden Death Valley was only ever seen during The Super Mario Bros. Super Show! episode "The Provolone Ranger". The name is also a spoof of Death Valley. Mario, Luigi, Princess Toadstool and Toad entered Sudden Death Valley aboard a stagecoach on their way to deliver a trunk full of Gold Coins to the citizens of Mushridge. They were soon ambushed by Billy the Koopa and a Koopa Troopa, who kicked Mario off the stagecoach and hijacked it, along with Luigi, Princess Toadstool, Toad and the Gold Coins. Mario was left to die in the heat of Sudden Death Valley, when he was rescued by Pronto, who informed him that he could tap juice from a cactus. Mario and Pronto then formed a partnership. After donning a masked cowboy outfit and going through some training, Mario became the Provolone Ranger, and set off to find Billy the Koopa. Mario and Pronto explored Sudden Death Valley, and came across a sign that led them into a canyon. However, they didn't realize that it was a trap until Billy the Koopa and his Koopa Troopas cornered them. Mario quickly came up with a plan that involved him distracting the Koopa Troopas, giving Pronto the chance to seize their Cobrats. However, Pronto was caught by a Pokey, and taken to the Double Cross Ranch. Mario soon arrived at the Double Cross Ranch on his Ostro, and took out the Koopa Troopas that were there by shooting them with miniature silver plungers. Billy the Koopa fled from Mario on his Ostro, and Mario chased him through Sudden Death Valley until he could steal back the Gold Coins from him. Although Billy the Koopa had been knocked off his Ostro in the process, Mario realized that he instead had to save his friends, and returned to the Double Cross Ranch to do so. Afterwards, Mario delivered the Gold Coins to the people of Mushridge, and prepared to travel onwards through Sudden Death Valley. However, the mention of dinner brought Mario running back. This page was last edited on April 3, 2018, at 19:43.